Thirty-one essays illuminating the spiritual truths exemplified by our canine companions. We spend countless hours training our dogs, but how often do we consider what they have to teach us? “Our canine companions aren’t just our best friends,” explains Tami Simon. “Sometimes they can also be carriers of a special medicine and the wisdom lessons we most need.” The Dharma of Dogs shares the reflections of spiritual teachers and writers who have found a source of deep truth and practical wisdom beneath the furry surface of our four-legged friends. For anyone who loves dogs—and who has learned and grown through this special relationship—these 31 essays offer humor, solace, inspiration, and insight into the life lessons our dogs make available to us, exploring such themes as unconditional love, connecting with nature, facing our fears, and much more. 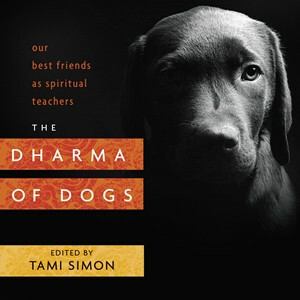 Edited by Tami Simon, The Dharma of Dogs includes contributions by Alice Walker, Eckhart Tolle, Pam Houston, Mark Nepo, Roshi Joan Halifax, Adyashanti, Julie Barton, angel Kyodo williams, JP Sears, Lama Surya Das, Diane Musho Hamilton, Allan Lokos, Andrew Holecek, Bonnie Myotai Treace, Chris Grosso, Geneen Roth, Jeri Parker, Joan Ranquet, Lama Tsomo, Laura Pritchett, Mirabai Starr, Sarah C. Beasley, Stuart Davis, Susan Martin, Susanna Weiss, and His Eminence the 25th Tsem Rinpoche.